In the fall of 1619, a hurricane dashed the English Galleon Warwick against the cliffs of Bermuda’s Castle Harbor. After lying beneath the sand for nearly four centuries, the ship has been uncovered again. Some people believe the most valuable thing that we can get from a shipwreck is information about the past. Others think that it is antiquities, or treasure. Shipwreck archaeology offers so much more. It is a chance to engage the public, to make history relevant and to inspire. I believe that active public outreach is an obligation that comes with the privilege of excavation. 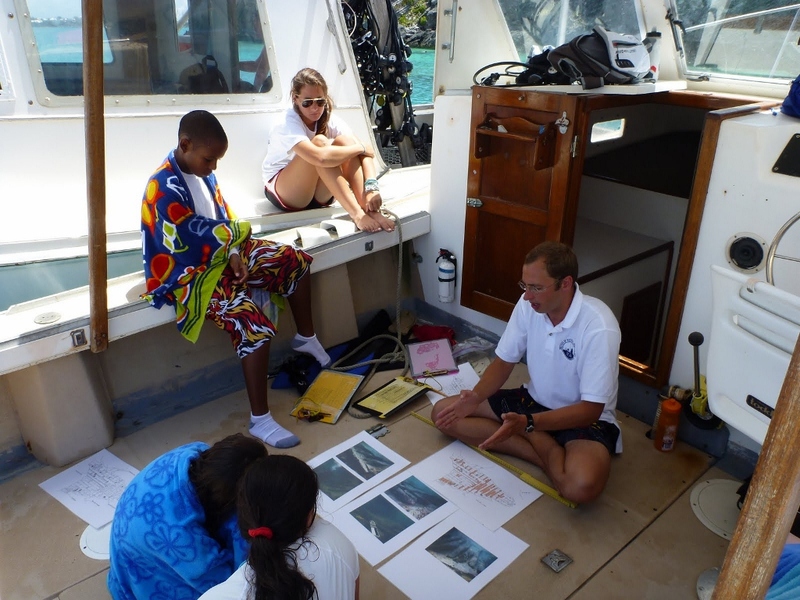 While excavating the Warwick last summer, the most important opportunity we had was to work with an amazing group of middle school and high school students from the Bermuda Institute of Ocean Sciences (BIOS). They dived on the wreck, collected soil samples, examined artifacts and spoke with us about how archaeology brings science and history together. We were amazed by their energy and insightful questions! BIOS created a film about Warwick and underwater archaeology. Last week, it was shown to all of Bermuda’s primary school students as part of an educational curriculum that promotes heritage awareness, and boosts interest in science and archaeology. On behalf of the entire Warwick Team, I would like to extend a public thanks to BIOS and the Bermuda Maritime Museum. I would especially like to thank Kaitlin Baird and Elena Strong who were so helpful in coordinating efforts. Check out the BIOS Ocean Academy blog, with posts on their Marine Science Interns, Explorers and the Wreck itself. Oh man – I am never going to hear the end of that one! In my defense… it was all live – no script – and the boat full of students had me nervous! Reblogged this on Warwick Shipwreck Excavation.